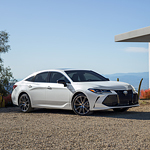 Distinct Exterior Features of the Toyota Avalon | Del Toyota Inc.
Toyota's full-size sedan, the Avalon, has been a popular choice for consumers for decades. Toyota is a brand known for reliability and quality craftsmanship. Both of those traits are on display in the new Toyota Avalon. The Avalon has many distinct exterior design cues that help it stand out. Our team in Thorndale love the quad exhaust tips. This gives the Avalon a muscular look to it without being too shouty. It lets you know that this car has some performance, but in an understated way. The Avalon touring also has blacked out accents that add to the calm aggressive looks. Toyota focused on making the car have clean and modern lines. The blacked out sports mesh grille up front also adds to the subtle aggression this car has. The Toyota Avalon is an understated subtle full-sized sedan. If you are interested in taking an Avalon for a test drive stop by Del Toyota Inc. and we will take care of you.